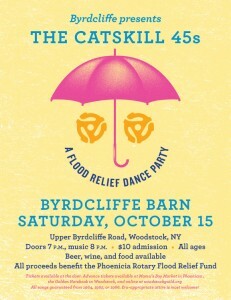 Historic arts organization, Byrdcliffe, in collaboration with The Catskill 45s, presents a dance party to benefit flood victims of Hurricane Irene. 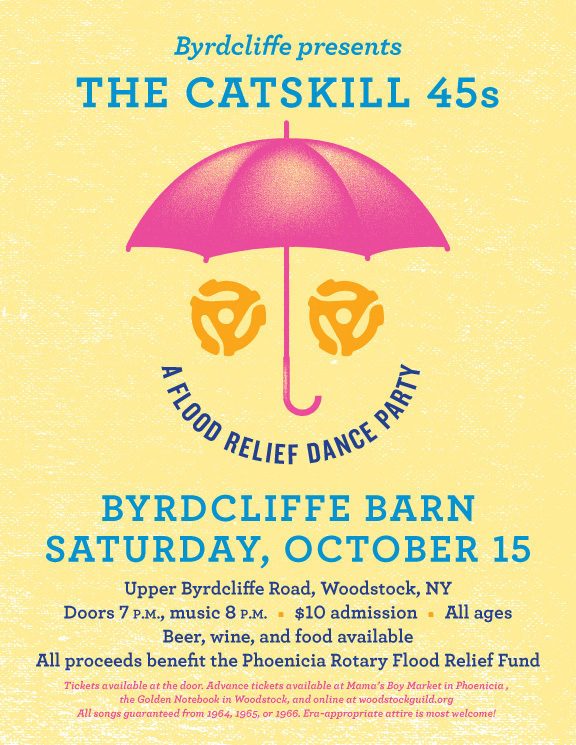 The Catskill 45s play a rare live show – a flood relief fundraiser at the Byrdcliffe Barn, Upper Byrdcliffe Road, in Woodstock on Saturday October 15th. The not quite superstar line-up of local musicians features Robert Burke Warren, Josh Roy Brown, Mark Lerner, Tony Fletcher and Nancy Howell trading lead vocals, guitars and keyboards, with Lukas Lerner on drums. The group came together in 2009 to play a 45th birthday party, performing only hit songs from the host’s birth year, 1964. The massive success of that event was repeated in 2010 and 2011, at which the 45s played sets drawing from 1965 and 1966 respectively. Their only public performance thus far was at the closing party for the Phoenicia Times, Halloween 2010. For the Byrdcliffe Barn show on Saturday October 15, the Catskill 45s draw from their full repertoire of hits from 1964-66, three of the greatest years in pop music history. Expect to hear not only the songs of the Beatles, Bob Dylan, the Who, Wilson Pickett, the Kinks, the Supremes, the Lovin’ Spoonful, and the Monkees, but all manner of one-off hits from the worlds of soul, country and surf. Doors will be at 7pm. The show is all ages. Tickets are only $10, and are available in advance at http://www.woodstockguild.org/ , Mama’s Boy Café in Phoenicia, The Golden Notebook bookstore in Woodstock as well as at the door. Wine, beer and food will be served. The Catskill 45s will perform two lengthy sets. NB: When the Catskill 45s hit the stage, the crowd hits the floor. Come prepared to dance the blues away!